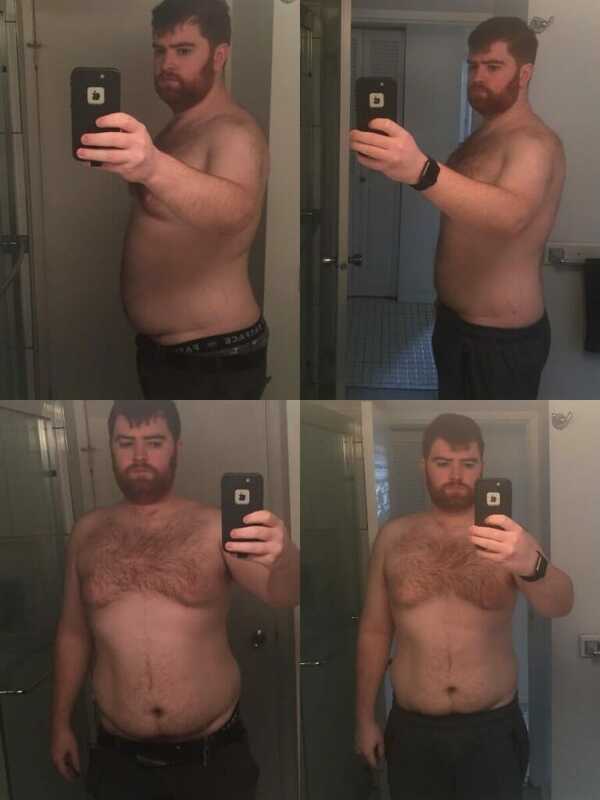 This month’s featured client is Dylan – a fairly new client to StrongerYou (he’s been with us just shy of 4 months now). Despite the short timeframe, Dylan has made exceptional progress by pushing himself and trusting the process. His original goals were to drop some bodyfat and be able to climb the stairs without having to stop to catch his breath. He now makes easy work of prowler pushes and has lost over 20lbs. Just a 3 month difference between these pictures and you can already see the significant changes that Dylan has made: over 20lbs of fat loss and drastically improved posture. When I started working with Chad my goal was simple, lose weight. After just four months of working with him I couldn’t be happier with how it’s going, losing over 20 pounds in that time. Working with Chad hasn’t only helped me lose weight but as by-product has helped me improve my mobility, strength, and posture. It by no means has been easy work, working out 3 (sometimes 4) times a week, watching calorie intake and doing extra mobility work at home but I wasn’t looking for a quick fix. I wanted a long term fix, something manageable that won’t let me fall back into old bad habits. Overall the experience has been enjoyable, sure there are aspects of the training that are hard and I hate the thought of doing (split squats been one!) but like everything in life if it’s worth doing it’s going to be hard, and it gets easier down the line. With the huge personal progress I’ve made in the first 4 months I’m looking forward to what the next 4 months, and beyond, bring. One of the coolest parts with working with clients like Dylan is the the understanding that fitness is a marathon, not a sprint. He knows that in order to get the results he wants, it’s all about looking at the long game and taking it one step at a time. Here’s to more gains down the road, Dylan! Enjoy your new SYPT bottle. Want to be featured as our next client of the month? Check out our personal training methods and take the first step towards a StrongerYou by booking a free consultation online or by phone at 604-562-3719. Looking for the best information on the web for fat loss, muscle gain, and sports training? Get it delivered straight to your inbox by signing up for our newsletter below, and receive your FREE copy of the SYPT Back Pain Manual.